Etax4868.com has launched blog sites designed to informing filers of important information on Form 4868. Etax4868.com has launched a series of blog sites designed to help keeping users informed about Form 4868- A request for an automatic extension of time to file individual taxes. April 15 of each year is the due date for filing Federal individual income tax returns if filers tax year ends December 31st. The return is considered filed timely if the envelope is properly addressed and postmarked no later than April 15. If the filer uses a fiscal year (which is a year ending on the last day of any month other than December), the tax return is due on or before the 15th day of the fourth month after the close of the fiscal year. If the due date falls on a Saturday, Sunday, or legal holiday, the due date is delayed until the next business day (i.e., Tax Year 2010 was due April 18, 2011). If filers cannot file by the due date of the return, then they can request an extension of time to file. However, an extension of time to file is not an extension of time to pay. Filers will owe interest on any past-due tax and they may be subject to a late-payment penalty if timely payment is not made. To receive an automatic 6-month extension of time to file the return, Users can file Form 4868, Application for Automatic Extension of Time to File U.S. Individual Income Tax Return, by the due date of the return. 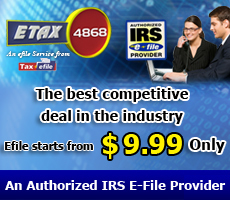 To learn more about form 4868 visit Extension4868.com or Visit Etax4868.com to begin filing today.